Sean Linnane: "IT WAS JUST A STRAIGHT-UP BRAWL"
Brutality of 1994 Panama fight still resonates with U.S. troops . . . S.L. Officially it wasn’t even a battle. The U.S. soldiers and the men they fought weren’t even enemies. But 17 years later, the veterans of this “medieval fight” remember every inch of the battlefield. “It was just a straight-up brawl,” recalled Sergeant First Class Arturo De La Garza, an Army Specialist on that day. Outnumbered more than five to one, the Americans endured 20 unforgiving minutes that seemed like an eternity, unsure if they would emerge alive. There were no firearms or bombs, just raw, primitive weapons: clubs and shields and, most of all, thousands of baseball-size rocks that shattered the U.S. troops’ bones and rained so densely that the sun seemed blacked out by a sea of stone. Some of the Americans had seen combat in the Persian Gulf War. Others later fought in Afghanistan and Iraq. Those men almost unanimously agree: Their fight in Panama on Dec. 8, 1994, was the equal in terror and ferocity of anything else they ever faced. No U.S. troops died that morning. But when they reunited more than a decade later, the U.S. veterans realized they’d all been casualties. Understanding how the men of Company C, 5th Battalion, 87th Infantry Regiment fought an unofficial, unnoticed battle in Panama requires a brief history lesson. In 1994, more Cuban refugees set out for U.S. shores than had tried in a decade, many in rafts and makeshift boats. The U.S. filled the U.S. 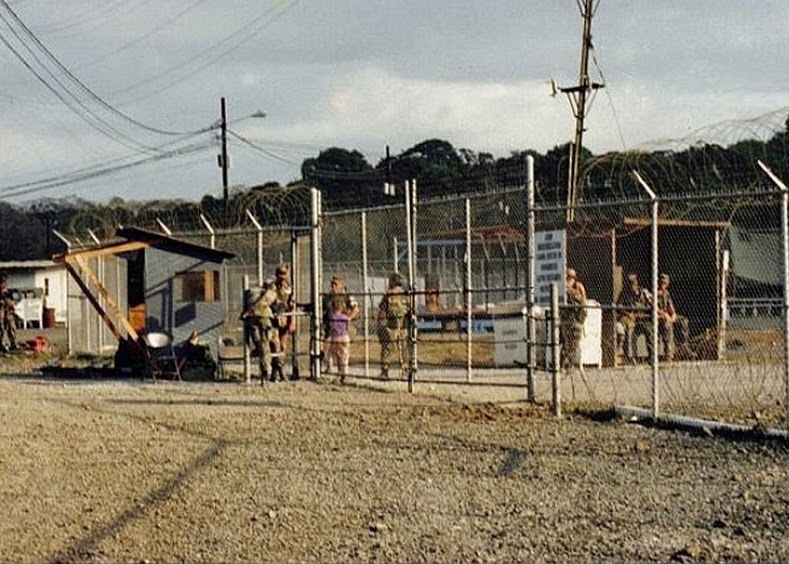 Naval Base at Guantanamo Bay with those it caught. Buying time, the U.S. built four large, temporary camps on a military reservation in Panama called Empire Range. The effort was called Operation Safe Haven. General Barry McCaffrey, 52 at the time, was the four-star commander of U.S. Southern Command. In an interview last week, he said he sympathized with the Cubans, even as it was his job to detain them. The Cubans lived in large military tents, 100 tents in each camp, built on concrete slabs. The perimeter of each camp was lined with chain-link fence. There were soccer fields and dining facilities. With so many people living in a wet climate, the ground was covered with rocks to allow water to drain away quickly. By fall 1994, about 10,000 refugees waited warily at Empire Range. McCaffrey recalled walking through the camps with his wife and talking to them. If they had to go into the camp to restore order, U.S. soldiers would be armed only with wooden batons and plexiglass shields. Several times in November and early December, Company C quelled demonstrations. Each time, things died down without violence. On Dec. 7, however, news came down that most of the refugees would be returned to Cuba. About 500 Cubans rioted inside Camp No. 1. They burned at least one tent, and stole and crashed a military Humvee. Company C was at Fort Davis, a three-hour drive or 15-minute helicopter flight away from the camps. An hour later, at 6 p.m., they were landing at Empire Range. Things quieted down. Company C guarded the camp all night. By mid-morning, a crowd gathered again on the soccer field. There were two gates to Camp No. 1, both toward the northeast side. The plan was for the Air Force security police to march in from the main gate, while Company C advanced from the side gate. As Company C moved toward the field, its members would force the Cubans toward the dormitory tents. The soldiers formed up near the dining facility, which blocked their view of the soccer field. About 20 refugees gathered at the gate, wearing masks that they’d made from white T-shirts. They taunted the Americans. A few of the U.S. troops were bilingual. They tried not to laugh at some of the more creative insults. The sun was hot. An hour passed. A soldier came by with hockey-style shin pads. There weren’t enough for everyone. Inside the camp, the Cubans tied the gates shut and pushed bleachers from the soccer field against the fence. “Finally we got the word,” Epley said. 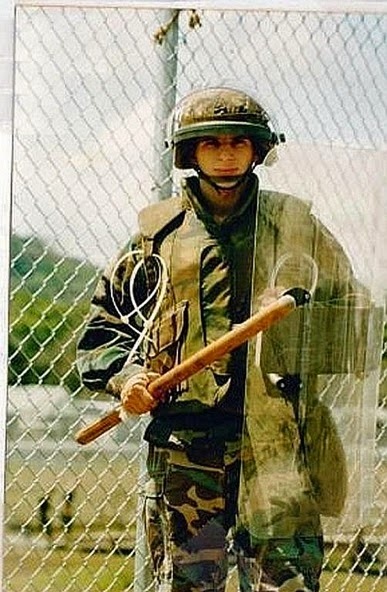 He and two other soldiers went to work on the gate. By now the Cubans were hurling the drainage rocks at the U.S. troops. A few rocks broke through the fence. One of them hit a soldier in the face. They got the gate open slightly, and Epley raced through. He charged at a group of rioters, screaming, with his baton in the air. The sight of the crazed American soldier sent them scurrying. The Cubans retreated around the corner of the dining facility. Marching three abreast with their riot shields up, as if in a parade, Amerine’s 1st Platoon walked along the back of the dining facility. As they turned the corner and faced the soccer field, they finally saw what they were facing: hundreds and hundreds of angry rioters. “The sky filled with a dark cloud of stones,” Amerine wrote later. Another soldier, Spc. Robert Young, wasn’t far behind. He’d been in the Persian Gulf War and was one of the few combat veterans in the company. He’d never seen anything like this. Jason Amerine led an ODA in the early days of the 'stan. The NRA (I think it was) did an awesome video series about what he and his guys (several were KIA if I remember correctly) did over there. Clinton sold them out. Communist oppression meant nothing to him. Now, Obama lets in people from Central America oppressed by warm beer.